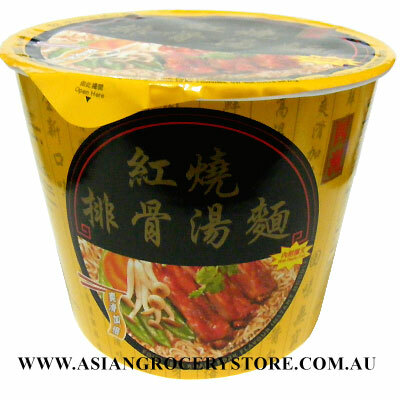 Minimum quantity for "Four Seas Roast Pork Flavour Bowl Instant Noodle 90g" is 1. Noodle: Wheat Flour, Starch, Palm Oil, Salt, Thickeners (E412,E415, E407, E1401),Emulsifiers (E 405, sodium caseinate), Humectant (E452(v1)), Colour (E100 (i)). Soup Base: Salt, Sugar, Flavour Enhancers (E621, E635), Pork Powder, ( contains Soybeans), Flavour and Flavouring, Spareribs Powder, Soy Sauce Powder ( contains Soybeans ), Starch, Colour( E 150d ). Flavouing Oil: Lard, Chilli Sauce, Palm Oil, Soy Sauce ( contains Soybeans ), Salt, Flavour and Flavouring, Starch. Dehydrated Vegetable : Dehydrated Carrot, Dehydrated Borecole, Dehydrated Green- Stem Cabbage, Dehydrated Shallot.